Let there be…….dark! – Trees & Flowers & Birds! I left for work yesterday morning pondering the internet situation in our house which had completely died on Wednesday night. Ok, not completely – the wireless network crapped out – one computer could still direct connect to the modem. I figured I would call Time Warner, upgrade to their wireless networking system because I am tired of maintaining the router myself (and clearly the “new” Netgear router was a piece of trash), get the first appointment they had and then figure out how we would get through without wireless. You know, such a deep deep, real world problem – no wireless internet – no laptops – no Xbox live – HORRORS! So, of course the planet had to remind me just how insignificant no wireless internet for one night might be by unplugging us completely. We now know that ONE – get that? ONE worker in Arizona had a total brain fart and pretty much ended up disconnecting the entire southern California grid at 3:20pm yesterday. Woosh! Massive black O-U-T. Several million people without any power. Cell phones spotty at best – though working enough to figure out where family was and to hear that school would be closed today and then also that work would be open. I mean, really? ONE GUY did all that? can you say infrastructure breakdown? Thankfully the early radio reports that we might not be back up until Saturday were wrong and we had power by 2am at my house so it was not even 11 hours. That I bought gas on the way in to work when my yellow warning light came on. I am notorious for not wanting to stop anywhere on my way in to work yet something in my brain said “just do it!” and I am very glad I did. That I did at least have $10 in my wallet – which is rare since I hardly ever had cash, but I had saved some for the JV football entrance fee tonight. That it was a gorgeous summer night with almost no wind and that the moon was ablaze and that we could see every star. That our refrigerator water supply died a year ago so I always have jugs of drinking water on hand. That we have a battery powered radio and even found batteries for it! That I have been putting out those solar battery powered landscaping lights around my large yard over the last two years and that Son #1 immediately thought of bringing them inside as it got dark – PERFECT sources of life – safe and effective. One in each bathroom and then we were all carrying them around with us. That we all love playing board games and that Scrabble didn’t sell at the garage sale!! We started a mini bonfire in the shell of a dead bbq, hung a flashlight from the roof of the patio cover for a spotlight, turned on the radio and played Scrabble for a couple of hours. It was so fun! Plus, I won despite Son #2 taking my damn letters I wanted to use every turn! That somehow through the spotty cell phone signal, I heard from my parents, a friend I was supposed to meet for dinner, and that the texts & voice mails from my workplace and from Son #2’s schools got through. Somehow so did the Padres score text messages – as they lost yet again – ironically IN Arizona, the source of our darkness! Overall, it was a kind of fun night! I’m back at work today, the JV football game is apparently ON for later and Time Warner is still coming out to fix the internet tonight. Oh, and something else is still happening. SDG&E sent a notice two weeks ago that they need to replace a corroded power line. Which means – yes – no electricity from Sat at 10pm until Sunday at 8am. Hard to believe just ONE guy could wreak so much havoc. I survived the NYC blackout a few years ago so I understand completely. 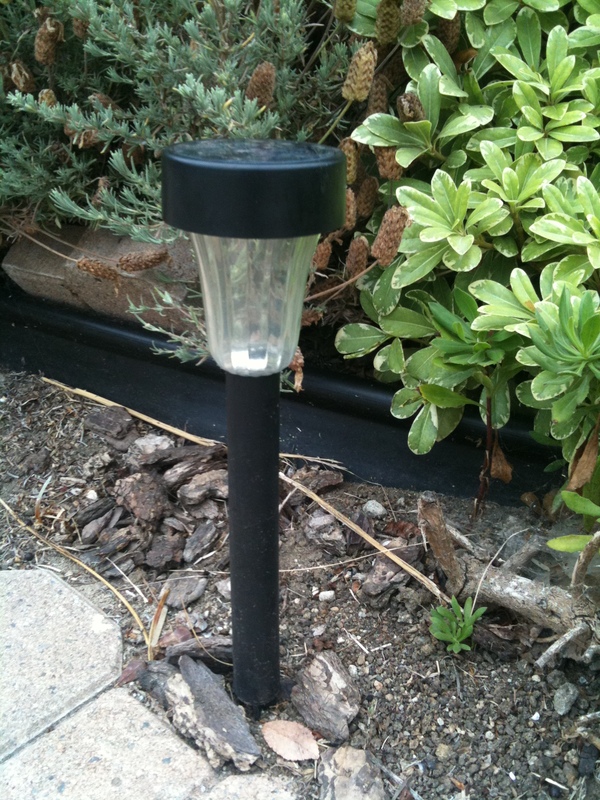 And I even picked up a tip – solar battery powered landscaping lights ! Never occurred to me, but a really good idea, will keep that in mind!